Are you searching for the best selection of rides for your Melbourne event? Look no further than Smart Amusements – we have an extensive range of children’s and family amusement rides for hire. Our mission is to provide clients with modern, high quality and well maintained equipment to make your event a safe and happy experience. Whether you hire kids’ amusement rides, games, entertainment, food equipment or all four, you are guaranteed a professional service at an affordable price. We pride ourselves on helping you create an event to celebrate, ensuring the highest customer service standards. Whatever you’re on the hunt for, Smart Amusements have your event sorted! Contact us today to enquire about our amusements. 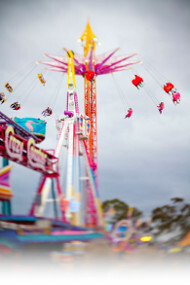 All our amusement rides are covered by$20 million Public Liability Insurance and are regularly checked by a qualified engineer and electrician, as well as being regularly audited by Worksafe Victoria representatives. We work closely with our engineer and Worksafe Victoria to ensure all our rides comply with Australian Standards and are safe for your event. All our operators are competently trained to set up/ dismantle and operate the ride they are responsible for as well as providing excellent customer service. With our massive range, including jumping castles, and unbeatable customer service, we are certain we can provide a solution for any event and entertain people of all ages. Discover more about what we can do for you by getting in touch. Call or email us to learn more about our family and kids’ amusement hire in Melbourne and to find out how we can help you with your event and entertain your guests. Do not hesitate to ask for assistance in obtaining any item not listed on this website. Feel free to call us on (03) 9555 6606 and talk with one of our team members, or use our contact form and we will get back to you as soon as we can.